You are visitor number 758440. D.F. Levey, H. Le-Niculescu, J. Frank, M. Ayalew, N. Jain, B. Kirlin, R. Learman, E. Winiger, Z.A. Rodd, A. Shekhar, N. J. Schork, F, Kiefe, N. Wodarz, B. Müller-Myhsok, N. Dahmer, GESGA Consortium, M. Nöthen, R. Sherva, L. Farrer, A. H. Smith, H. Kranzler, M. Rietschel, J. Gelernter, A. B. Niculescu. Genetic Risk Prediction and Neurobiological Understanding of Alcoholism. Translational Psychiatry 2014 Epub May 20. Ingenuity, KEGG, and GeneGo Pathway Analyses of top candidate genes for alcoholism. Le-Niculescu H, Levey D, Ayalew M, Palmer L, Gavrin LM, Jain N, Winiger E, Bhosrekar S, Shankar G, Radel M, Bellanger E, Duckworth H, Olesek K, Vergo J, Schweitzer R, Yard M, Ballew A, Shekhar A, Sandusky GE, Schork NJ, Kurian SM, Salomon DR, Niculescu AB. Discovery and validation of blood biomarkers for suicidality. Molecular Psychiatry 2013 Epub August 20. 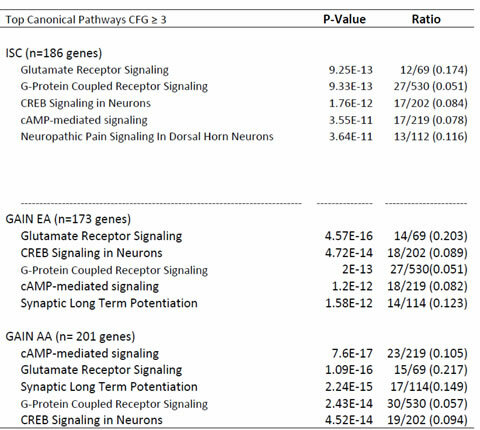 Ingenuity and KEGG Pathway Analyses of top candidate genes for suicidality. Ayalew M, Le-Niculescu H, Levey D, Jain N, Changala B, Patel SD, Winiger E, Breier A, Shekhar A, Amdur R, Koller D, Nurnberger JI, Corvin A, Geyer M, Tsuang MT, Salomon DR, Schork NJ, Fanous A, O'Donovan M, Niculescu AB. Convergent Functional Genomics of Schizophrenia: From Comprehensive Understanding to Genetic Risk Prediction. Molecular Psychiatry 2012 Epub May 15. Ingenuity Pathway Analysis of top candidate genes for schizophernia. A comprehensive model for schizophrenia pathophysiology. Biomarkers, Pathways and Mechanisms. Translational Psychiatry. Epub 2011 May 24. 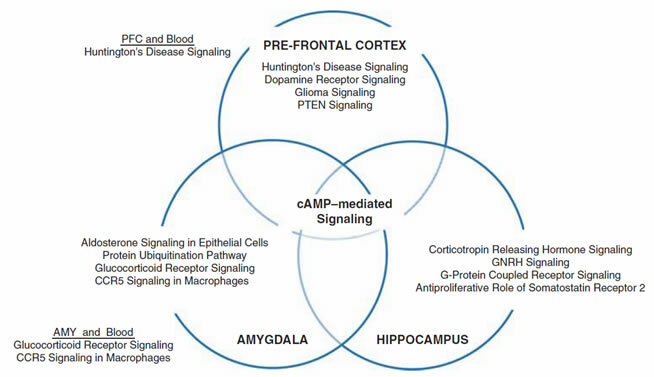 Top biological pathways for anxiety in different brain regions. Overlap between brain regions, and with the blood. Patel SD, Le-Niculescu H, Koller DL, Green SD, Lahiri DK, McMahon F, Nurnberger JI, Niculescu AB. Coming to Grips With Complex Disorders: Genetic Risk Prediction in Bipolar Disorder Using Panels of Genes Identified Through Convergent Functional Genomics. American Journal of Medical Genetics Part B (Neuropsychiatric Genetics). Epub 2010 April 9. SM Kurian, H Le-Niculescu, SD Patel, D Bertram, J Davis, C Dike, N Yehyawi, P Lysaker, J Dustin, M Caligiuri, J Lohr, DK Lahiri, JI Nurnberger Jr, SV Faraone, MA Geyer, MT Tsuang, NJ Schork, DR Salomon and AB Niculescu. Identification of blood biomarkers for psychosis using convergent functional genomics. Molecular Psychiatry. 2009 Epub Nov 24. 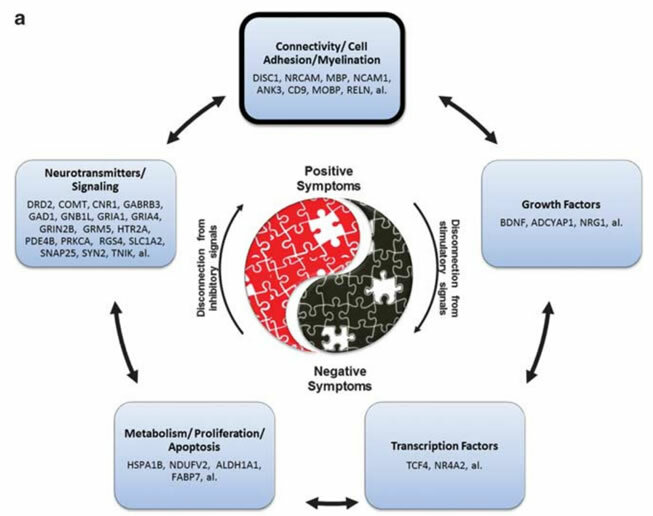 A comprehensive model for bipolar disorder pathophysiology.